Monterosso is northernmost of the Cinque Terre, its largest village and the only town in the Cinque Terre with a proper, sandy beach—and a big parking lot for the commensurate crowds of Italians to take advantage of said beach and its ranks of beach chairs shaded by giant umbrellas (which you can rent for a small hourly fee). Monterosso also sports a handful of proper sights. The best is the Convento dei Cappuccini, atop a tiny hill in the old town with a Crucifixion by Flemish master Anthony Van Dyck (who worked in nearby Genova for a while), but the aquarium (closed on and off in recent years) and a museum of anchovy salting (no, seriously) get more attention—possibly because they charge admission. Neither of them is terribly interesting, but if you have the spare time, entry is included on the Cinque Terre Card. Monterosso may be the busiest of the Cinque Terre towns, with the most hotels, restaurants, and bustle, but calling it "busy" is a relative thing. The town remains little more than an oversized fishing village, with all the attendant charms. Clothes drip dry from washing lines above the tourist office, the narrow streets are clad in stone, and in the evenings, as the sea gentle tumbles the shoreline's boulders, a cadre of the town's sun-raisined, wizened men colonize the bocce court wedged between the train tracks and the trail to pick up where they left off the night before in a game that has been going for generations. Hang around long enough, and they just might invite you to join in. Sadly, flash floods on October 25, 2011, gravely damaged the Cinque Terre, doing considerable damage to the old town of Monterosso (and devastating nearby Vernazza). The residents there are digging out from the mud and rebuilding, but it may be a while until Monterosso is back to its old self. As of early 2012, only the newer part of town is fully open. You can keep track of what is going on at www.rebuildmonterosso.com. Rick Steves is rallying to the cause of the region he helped put on the tourism map, and you can find regular flood recovery updates (as well as links to local aid orignizations) in the "News" section of his site: www.ricksteves.com. Note: Due to the flood, most of Monterosso's Old Town is still closed. Until the town finishes recovering and rebuilding, you'll have to stay in the New Town or elsewhere in the Cinque Terre. Surprisingly, there aren't that many apartments in Monterosso—though Gaudio Grazia (Via Buranco 15, tel. +39-0187-817-485 or +39-338-809-8783) rents two basic flats, sleeping six people total, in an old house about five minutes from the beach; they cost €20–€40 per person. There are about two dozen rooms to rent, B&Bs, and even an agriturimo listed at www.parconazionale5terre.it. 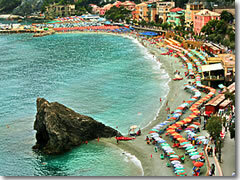 Monterosso is the most developed of the towns, making it another good base for exploring the region. There's little specifically to do here (modest museums aside), other than lounging on the sandy beach and maybe watching the bocce courts in the evening. Spend as little time or as long as you'd like. They now have the nerve to charge you to hike the old goat paths between the villages. This ticket is called the Cinque Terre Card, and you can get one valid for 1 day (€5), 2 days (€8), 3 days (€10), or 7 days (€20). It includes admission to the trails, use of the (frankly superfluous) tiny buses in some towns, the occasional elevator, and entry to a few tiny museums (local history in Riomaggiore, wine in Manarola, and here in Monterosso the aquarium and the anchovy museum). Monterosso is on the regional Cinque Terre rail line, passing Vernazza (3–6 min. ), Corniglia (7–14 min. ), Manarola (11–21 min. ), and Riomaggiore (14–28 min.). Monterosso is also 14–39 min. by train from La Spezia, where you can change for trains throughout Italy (sometimes you change at nearby Sarzana), including Pisa (1:15–2:30 hr. total), Lucca (1:25–2:35 hr., sometimes change at Viareggio; sometimes change twice), Florence (2:30–4 hr. ), and Rome (4:30–5:30 hr. ).